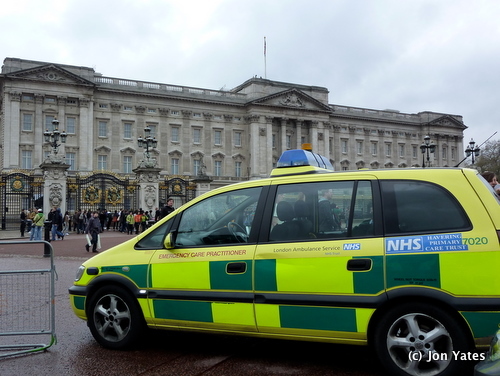 In response to requests from their commissioners, London Ambulance Service NHS Trust (LAS) has decided that they will no longer employ Emergency Care Practitioners (ECPs) as part of their workforce. Existing ECPs will be transitioned into suitable alternative employment, with the hope that they will contribute their varied skills in their new roles. Reflecting on this, I was reminded about a talk I gave at NHS Live in 2004 when ECPs were very new. I spoke in a couple of ‘workshops’ with Professor Sir George Alberti about the benefits of Emergency Care Practitioners to the patient and to the NHS. Sir George was the NHS Tzar for Emergency Care at the time and we did a joint presentation about new developments in emergency care. In particular I gave a case study presentation that illustrated the difference it could make to the patient if an ECP arrived to look after them rather than the traditionally double-crewed ambulance. I decided to use the case of an elderly lady with a cut to her lower leg who I had been to previously. In this situation an ambulance would normally have conveyed her to hospital for treatment but I described how, as an ECP, I would be able examine and treat her in the home and save her a trip to hospital. It was a huge event with medical and nursing representatives attending from all over the country; I was really very nervous. Carol Smilie was hosting and Tony Blair was a keynote speaker; no pressure there then! However, it went quite well despite my nerves and lots of people approached me afterwards interested to know more. The National Archives has a snapshot of the emergency care bulletin that was released at the time. Have any thoughts about this change in workforce configuration? Be sure to leave me a comment.